Son of Cheesechucker The name says it all - another member of the Cheesechucker family. Magog Base Prototype The model trebuchet that was really a 3-D "blueprint"
Sandman / Sandbag "Grandson of Cheesechucker"? - The latest member of the Cheesechucker family. Warren's Onager Warren's first siege engine model, and our first onager. Tea Trolley A very different medieval torsion "anti-siege" engine. Mousetrap Simple (and tiny) toy onagers. 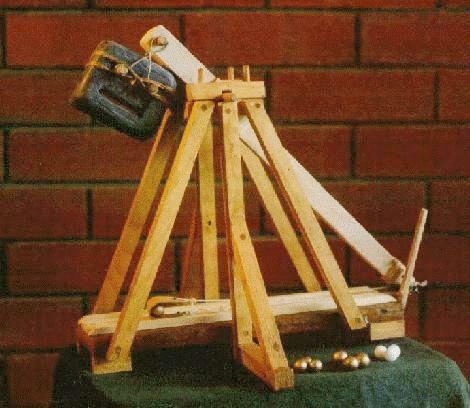 Cheesechucker was our earliest trebuchet of any size. 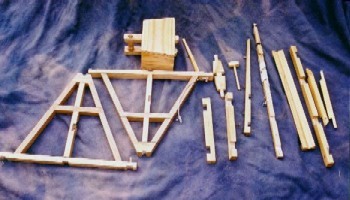 Made as a simple prototype from pine scraps and an old home-made 3.5 kg diving weight, it showed us that the idea of making siege engines could work - and using it in Bill's back yard gave us the first hints of the way such things as projectile mass, sling length and release prong angle effected the trajectory of the shot. 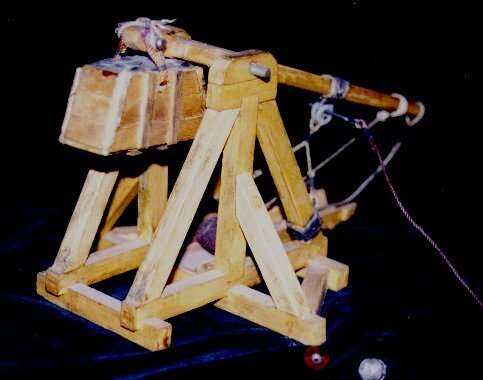 People all over the world started referring to this sort of tabletop trebuchet as a "cheesechucker". Our rough little toy was having its moment of fame. The kind of projectile mass Cheesechucker threw was about 15 - 35 grams, or approximately 1/200th to 1/100th the power mass. This was somewhat over-powered and may account for its tendency to shove itself backwards and forwards on the ground during a shot... but the distance obtained with the light shots was impressive. One of the lighter projectiles (a glass marble) was tossed by this little machine and hit a fence 23.5 metres away... not bad for a gravity-powered toy, and intriguing for us at the time considering that Gog with a 1.6 metre beam and a 70 kg weight (later upgraded to 90kg) was only hurling about 55m. Cheesechucker is still around, hardly ever seen and mostly living on a shelf in a back shed. However with nothing more than a quick pouch refurbishment it could be back in action, slinging that cheese. Status: Usable, but Mostly Decorative. Tiny was made as a birthday present for Paul, a Grey Company member who was very interested in model making. 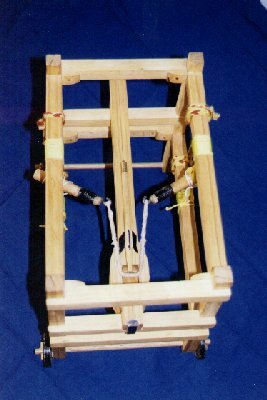 This not only meant that the level of finish had to be much better than the work-horse Cheesechucker, but also that the model needed to be made much smaller so that it was compatible with his existing collection. The weight box is actually a 280g moulded block of lead covered with a layer of wood. The frame timbers were sawn strips of pine cut from a wider piece. All frame joints were glued and dowelled. 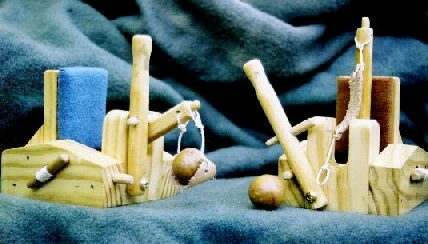 The trigger mechanism was a simple one never used on any other model or large trebuchet - a pair of rings held down by a string yoke that sandwiched a single ring on the underside of the beam. A loose pin attached to a string lanyard held them together. When the pin was pulled the rings and yoke fell onto the launch trough, but the sling was always out of the way by then, so no fouling occured. Tiny's performance is quite good for its size, with a range of about 5-6m using pea-sized projectiles of plasticine, wooden beads or small lead fishing sinkers. That range, as you might expect, is much improved with height (such as shooting from a tabletop). 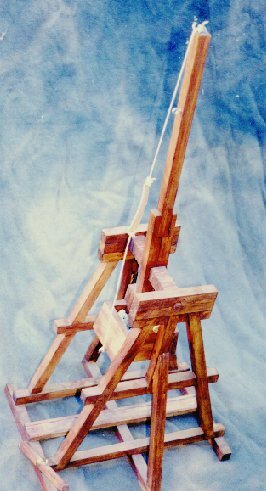 After these photos were taken (in Nov 2000) we had a Tiny trebuchet loaded with a wooden bead and an open hallway in front of it... so of course we shot it. The bead struck the hall wall at a range of approx 5 metres. The little treb still has what it takes. 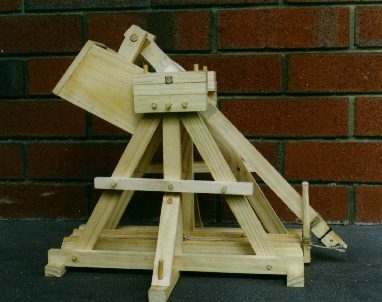 Son of Cheesechucker came about as a result of an invitation from American Woodworker magazine for me to provide plans and a model of a Cheesechucker-style table-top trebuchet. I looked at what was good and bad in the original Cheesechucker, considered what improvements I would like to make - and "Son of Cheesechucker" was born. 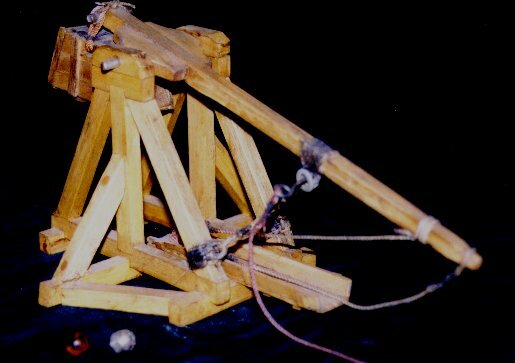 The projectile range may be something around 25m but, since the model travelled by courier from Perth, Western Australia to Pittsburg, USA and back, I think that I could put forward a good case for claiming a trebuchet range of tens of thousands of kilometres. Like its large Grey Co trebuchet relatives, SoC has a wooden axle which also benefits from being greased (in this case a light application of clear silicone). The weight box is of pine planking and is filled with approx 4.5kg of clipped squares of lead sheet. 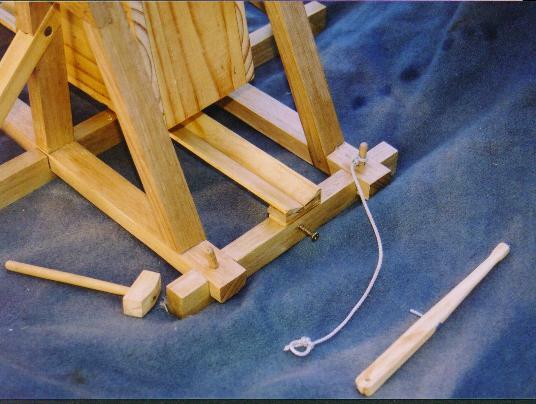 The length of the box's suspension arms means that when the trebuchet is "cocked", ready to shoot, the box is noticably propped up by its back edge pushing on the underside of the beam. Son of Cheesechucker's trigger is a timber and wire version of the standard Grey Co trigger (a loop on the underside of the beam, a lever anchored to the rear timber of the base and a hook that engages the beamloop about a third of the way up the lever). The sling pouch is relatively large and more suited to throwing objects like beanbag "hacky sacks" and pieces of bread rolls than small stones. This is probably a reflection of one of its common shooting venues, Grey Co banquets - although it has been used at public performances on a number of occasions to explain trebuchet workings to the audience. 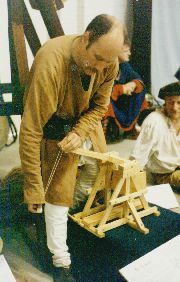 Here John is using SoC to explain the trebuchet to spectators at an indoor static display where the larger machines couldn't be used. Status: Successful trial piece, Currently an ornament but likely to be made operational some time in 2002. 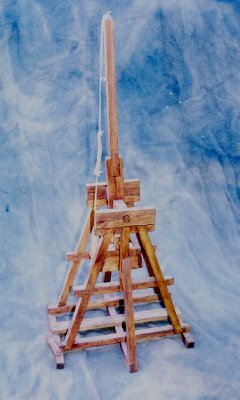 Before setting out to build Magog the trebuchet, John sensibly made a model to confirm that his ideas for the joinery and overall design were going to work. Not wanting to waste a perfectly good treb base -and following subtle hints from Trish (who was later to become his wife) - John fitted the model base with a trigger, beam and bucket and presented it to her. As far as I know it has rarely, if ever, been fired but the design is a good one (as proven by Magog) so, with a few adjustments to the bucket, this base prototype could easily become an active member of the Grey Co cheesechucker family. 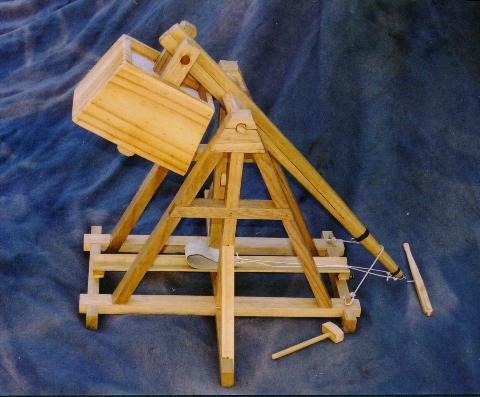 John recently mentioned that the base prototype is to be upgraded to become an operational tabletop trebuchet. Sandman / Sandbag (Its name is yet to be formally chosen) was made on commission as an improved version of the "Son of Cheesechucker" machine. Only marginally larger than Son of Cheesechucker, the main difference is in the better joinery used in the base construction. 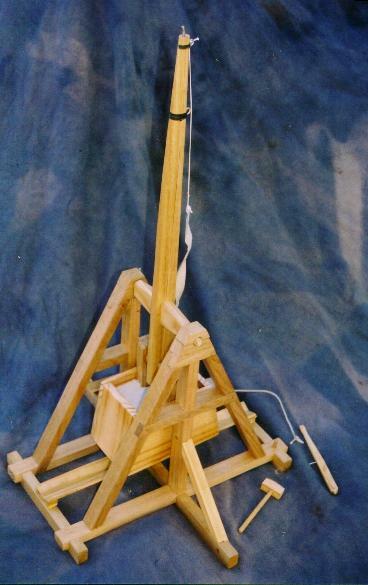 Most of the base is modelled on the Magog trebuchet (and so it resembles the "Magog Base Prototype" machine shown above) although the full height central upright in the side frames is not a Magog feature. The two part beam construction owes more to the Danish Medieval centre's beam construction than the 3-part beams on previous large Grey Co machines. Sandman also boasts a V-section trough.. something we hope to add to the larger Grey Co trebuchets soon. Sandman's new owner (named Sandy) will be loading the machine with lead ballast to give it a similar power mass as Son of Cheesechucker's 4.5kg. The model treb was shipped partly built. This is the collection of parts that was posted. 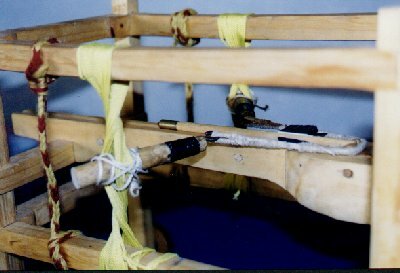 Sandman / Sandbag's trigger system is set up to use an interpretation of the rope-over-beam method shown in some medieval drawings (and shown in action in the first photo). 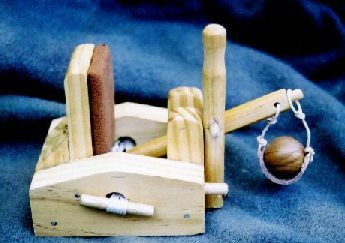 The toy hammer, which does a good job of knocking the end loop of the hold-down rope off the peg on the base frame, can be seen here. An alternative trigger, the standard Grey Co model "latch" trigger which uses a metal hook on a wooden lever to engage a loop on the underside of the beam, was also fitted. Both can be seen here. 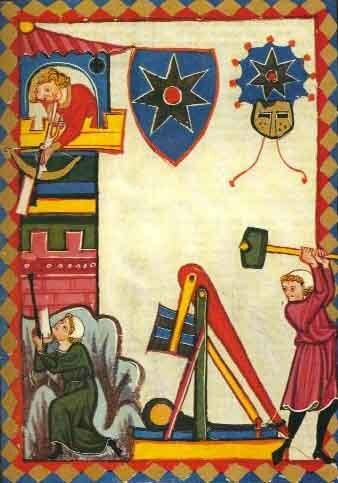 Warren is a newly-active member of the Grey Co siege engine enthusiasts (although a very long term member of Grey Co and a long term siege engine reader). His interest was mainly in torsion machines and he decided some time ago that he'd like to build an onager. Naturally the project would need to start with a model to test the ideas he had (and some of the design features he'd seen in 19th Century illustrations). A view of the Mk I version of the little onager shooting at Past Times 2000 - the photographer only just caught a little of Warren (far left), shown holding the lanyard having just loosed the onager's first public shot. Mk II - the original "Wonager" had a few limitations and Warren chose to build a new version rather than attempt to modify the old machine. In December 2001 the MkII had its first trials and showed its potential. 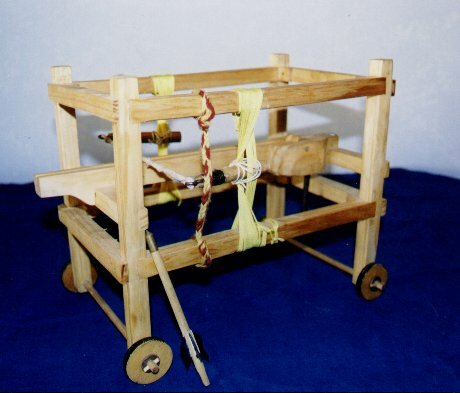 Although under-powered and lacking a suitable bundle-tightening spanner on this occasion, the machine's robust construction should allow it to eventually handle considerably higher power than the Mk I.
Teatrolley was built in June 2000 as a prototype to explore the ideas of Jean Liebel, as written in his book "Springalds and Great Crossbows", and to see whether this concept might be a simpler way to get started with torsion powered bow-like weapons than just leaping straight into building one of the complex ballista family. Medieval and later references to springalds almost always describe them being used as defensive weapons, eg mounted up in towers providing protective fire for gates. They gave defenders an affordable way of knocking a man in plate armour right off his horse (from a safe distance) - or skewering two or more unarmoured foes with one shot. Entered into the Grey Company 2000 Mid-Winters banquet competition for weapons as a prototype, the little model won first place - a real incentive to get on with the next stages of development. Now mostly tamed and tuned, Teatrolley can send its occasionally tail-wagging bolt about 20m. It's traditionally-made but synthetic bowstring is showing signs of wear and will need replacing before more and higher-power experiments are conducted. The concept seems proven, however, and larger - even swivel-mounted - versions are likely in future. Power Unit: 1 skein of 6 turns of braided ~1.5mm polypropylene builder's level string driving a sling-fitted throwing arm. Projectiles: Unshelled macadamia nuts, grapes, Blutack,	bread balls, chips (aka french fries), marbles (for serious toy soldier carnage)... and, of course, cheese. 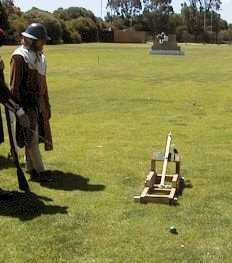 Range: 3 to 6 metres depending on string tensioner settings, projectile weight, catapult height and catapult angle. 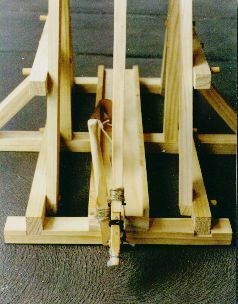 The first batch of five Mousetrap toy onagers was built in November 2001 as an exercise in putting together some small machines that would look good and work properly. This was quickly followed by a batch of four more. Part of the evolution of the design involved finding out what was important and what could be dispensed with. As mentioned, the side torsion bundle anchors were simplified dramatically after the first experiments showed that friction and the strong inward crushing force of the twisted string bundle meant that no locking pegs etc were needed to prevent the anchors rotating when the arm was pulled back. Just how strong this inward pull is was demonstrated early when the prototype managed to snap one of the anchor dowels and draw it into the 12mm diameter hole in the base's side frame..
To cope with this the dowels were replaced with thicker ones (shown in these photos). Even so, one of these new dowels snapped soon afterwards, so their diameter was increased yet again. Happily, as well as being stronger, the thicker dowels have the advantage of being more comfortable to grasp when winding up or releasing the bundle's power. Mousetrap's arm-catching pad supports most of the arm's length and consists of pine timber faced with a closed cell foam cushion (a piece of thick mouse pad - it seemed appropriate!)  covered by decorative cloth.